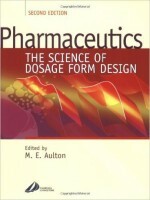 Pharmaceutics: The Science of Dosage Form Design is essential reading for every pharmacy student. It makes a very diverse, dry subject area into a comprehensible, more attractive one in just one test. It is clearly written at an appropriate level for both those new to the subject area and those more advance. It is both informative and descriptive, providing a basic understanding of pharmaceutics which is vital to all pharmacists and pharmaceutical scientists.